Here you can find different backgroundinformation. 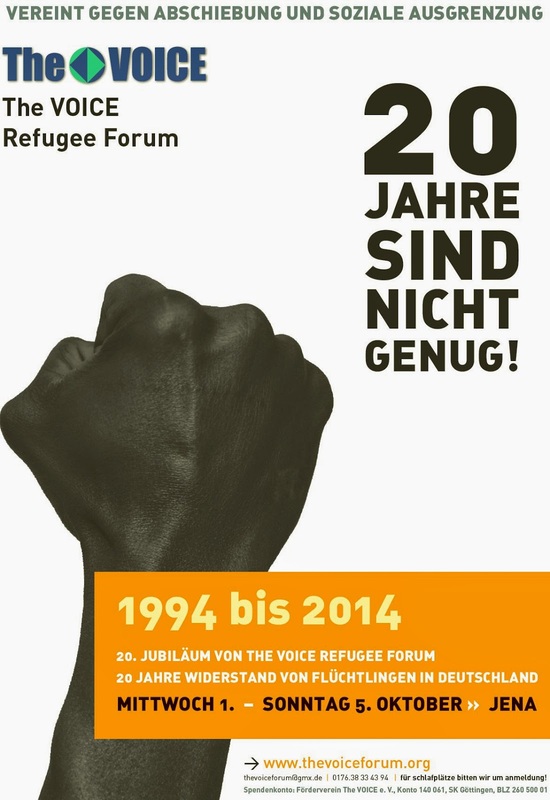 Ahmed Sameer, member of The VOICE Refugee Forum will protest in civil disobedience against the German Residenzpflicht-law which restricts the movement of asylumseekers to their landkreis and violates their human rights. The first court hearing on the three counts charge of police controls of Residence Obligation -pass law violation against Ahmed Sameers and his protest against “Residenzpflicht” will be held in the Amtsgericht Gotha, Justus-Perthes-Straße 2, Room 214, at 12 noon, on the 21st of June 2004. The caravan is organizing a second Internet Workshop in Bremen from July 3 to 5, 2004. The goal is to develop the caravan website further on and get a first introduction into online-journalism. Everybody who interested to participate can get in touch with the organizers by email. Friday 2nd – Sunday 4th July, 2004. Date: Friday 2nd – Sunday 4th July, 2004. Since the beginning of this year the persecution and deportation of refugees from Togo has increased massively. The peak level so far was the mass-deportation of 18 people from Togo and 26 from Cameroon, who were deported from Amsterdam under participation of Germany, The Netherlands, Belgium, France and the UK. Germany was involved with the deportation of 15 persons. During the night of May 25th/26th the political refugees from Togo and Cameroon were forced, against their protest, to enter a plane (Eyewitnesses stated it was a KLM airplane from the Netherlands) by the use of beating, pepper spray, dogs, plastic shackles and the new model of the "Deportation-Torture-Helmet" (These new models were presented by the German Home Office, after Amir Ageeb had died of suffocation because of being brutalized by border police and the use of a bike-helmet during his deportation in 1999). WHERE WE STAND IN THIS DEBATE. From the very beginning, we’ll like to state clearly that the views expressed here does not necessarily represent the entire Caravan Network as a we have not sought a full discussion and a decision on this. But suffice to say that this has been discussed in some groups within the network (with imputs) and therefore represents a broad line of thoughts on this issue. Since the last couple of years, the debate on the „Autonomy of Migration“ has raged through the Left in Germany and beyond in many public discussions like a wild fire in a hot Summer. It has become „en vogue and a hot cake“ to discuss it in every sphere. Theories, suppositions and assumptions coupled with some „revelations and discoveries“ have been brought to the fore in the course of this debate. In the process, different groups have alligned with or shared understanding if not total acceptance of some lines of thoughts on the issue while others have strived to place on board what is either deliberately overlooked or ignorantly considered irrelevant in this discourse. In the midst of these varying poles stands the sometimes conflicting and or complementary positions of some refugee-migrant and anti racist groups and individuals. How is it possible that we stand up for our principals in a society that seeks to destroy them? When the majority of the people are apathetic and prefer to look the other way so as not to feel that they themselves are somehow responsible? When breaking societal conventions means losing valuable solidarity? When racist and colonialist attitudes come not only from the mainstream of society and the government but also from the so-called progressive sectors? When practically no one else is willing to take the next step, leaving you not only alone and isolated but above all vulnerable? Thousands of illegal migrants from Sub-Saharan Africa are braving cold and wet nights in Moroccan forests in the hope of getting to Europe. The forests near Rahrah are only about 30 kilometres (19 miles) from Spain and when the weather is clear, the European mainland can easily be seen from the top of a hill. But trips across the rough Mediterranean sea aboard inflatable boats are very risky. Some 4,000 migrants have drowned in the past five years trying to get into Spain. We hold this truth universal declaration of mental rights and freedoms That all human beings are created different. That every human being has the right to be mentally free and independent. That every human being has the right to feel, see, hear, sense, imagine, believe or experience anything at all, in any way, at any time. That every human being has the right to behave in any way that does not harm others or break fair and just laws. 23rd January 2004 EU-Council of Ministers for Justice and Home Affairs in Dublin Cautions of UNHCR (United Nations High Commissioner for Refugees) Ruud Lubbers PRO ASYL: The ministers are executing the agenda of restrictions unaffectedly PRO ASYL appreciates Lubbers' critical diagnosis of the asylum system's state in Europe, but not the bigger part of his proposals for a changed asylum system. Yesterday UNHCR Ruud Lubbers was addressing the EU-Council of Ministers for Justice and Home Affairs cautioning about the collapse of the asylum system especially in the ten countries joining the EU. Gaston Ebua is a selforganised political activist and human rights campaigner. He is in an independent network of political refugees and activists - The VOICE Forum - within the Caravan for the rights of refugees and Migrants. He is a representative in Berlin of The VOICE Refugee forum project. While Gaston is registered as a resident of Berlin, he is presently prohibited by the German Aliens office in Darmstadt to take his residence in Darmstadt only.